It’s a sign of the times that Glenn Howerton, the star of NBC’s new sitcom “A.P. Bio,” will be unfamiliar to many of the network’s viewers. Howerton is in the ensemble of one of the most enduring comedies of the past two decades, “It’s Always Sunny in Philadelphia,” which has run for 12 seasons and has already been renewed for two more. Indeed, after the next two seasons, “It’s Always Sunny” will tie — ironically, if you’ve watched the show — the super wholesome “The Adventures of Ozzie and Harriet” for the longest-running live-action sitcom ever. But “It’s Always Sunny,” about the debauchery of a group of friends — including pretending to be intellectually challenged to get welfare, going to an anti-abortion rally to pick up women, and huffing paint — is on FXX, a cable bridge too far for some. The world of TV is fractured, like the world of music, and audiences have fallen into niches to the point where I often hear from readers who haven’t seen more than one or two shows on my annual Top 10 list. It’s very hard to imagine that happening 10 or 20 years ago, a time when we’d all know every star of any show that had been on the air for over a decade. Seeing Howerton in the more conventionally structured “A.P. Bio” is a pleasure, just as it’s a treat to see Kaitlin Olson, another “Philadelphia” cast member, on her Fox sitcom, “The Mick.” They each remain eccentric and push boundaries on their respective network comedies, even if their adventures aren’t as anarchic and outrageous. They haven’t been fully tamed, despite the tighter network standards and the broader audiences, although the happy endings on their shows do seem more pronounced. What does Jack have the kids do, as he sneaks around the clueless principal, played by Patton Oswalt? He essentially uses them to plot against his arch-nemesis, a philosophy professor named Miles Leonard (Tom Bennett) who has written a bestseller called “The Question Is the Answer” and who got a job at Stanford that Jack wanted. In the premiere, which airs on Thursday at 9:30 p.m. (the show returns on March 1, after the Olympics), Jack tells his class to catfish Miles, to lure him into an online affair under false pretenses. At moments, “A.P. 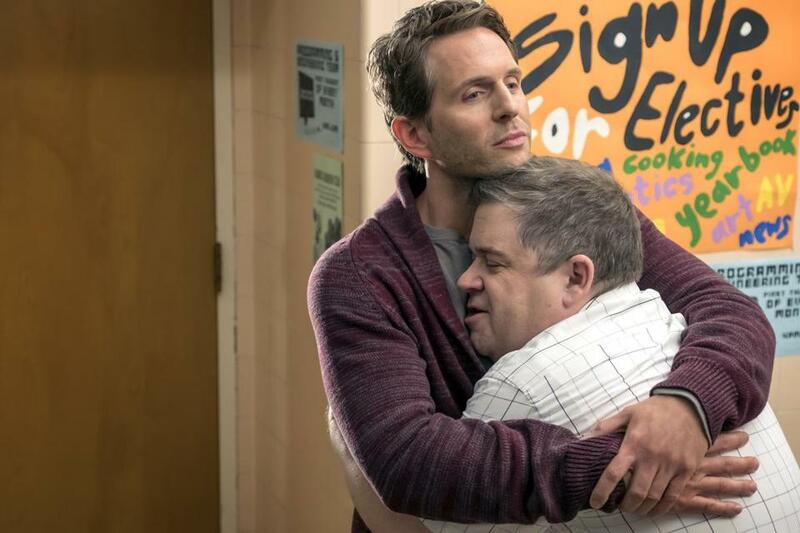 Bio” behaves a bit like “Community,” another classroom comedy that veered joyously off the track, and Howerton behaves a bit like that show’s star, Joel McHale. Howerton is well-cast as the self-centered, scheming guy who always seems to land on his feet. And he is surrounded by a supporting cast with potential, including Mary Sohn, Lyric Lewis, and Jean Villepique as fellow teachers and a class of adorable geeks. Created by Mike O’Brien, who executive produces with Seth Meyers and Lorne Michaels, the show also includes winning guest stars, including Niecy Nash and Taran Killam in episode two and, amusingly, Lisa Loeb in episode three. NBC has been improving its sitcom lineup lately, with “The Good Place” and, to some extent, “Superstore.” There’s a good chance “A.P. Bio” will become part of that upgrade, if it can dig even deeper into the secondary characters and their strange quirks at the same time as it features Howerton. The more the ensemble clicks, the better. Starring: Glenn Howerton, Patton Oswalt, Lyric Lewis, Mary Sohn, Jacob McCarthy, Jean Villepique, Tom Bennett, Aparna Brielle. On: NBC. Preview on Thursday at 9:30 p.m., then returns for a series run on March 1.